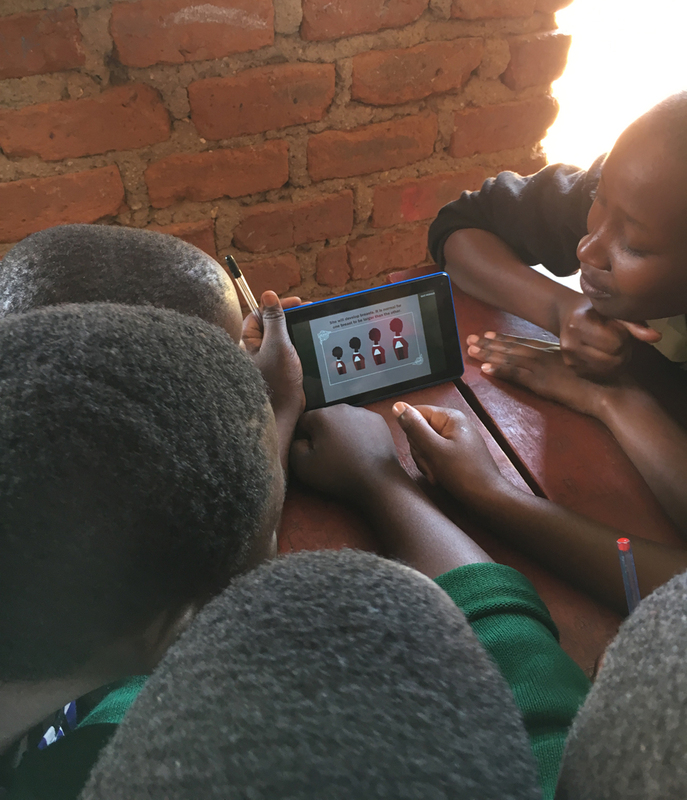 In a serendipitous collaboration with Santa Clara University, the nonprofit Rose Academies successfully launched a mobile device application to teach disadvantaged girls in Africa about the taboo topics of menstruation and sexual development. Designed to work on Android devices, HedhiHelp was developed by students in Santa Clara University’s (SCU) Public Health Science Program in collaboration with SCU’s Frugal Innovation Hub. HedhiHelp uses a story-like approach with colorful graphics — created by an SCU Studio Arts student — that are appropriate to the African culture. Stasi taught the HedhiHelp program to 45 rural, pubescent girls at Good Shepherd Primary School during a three-day workshop. None of the girls had held a technological device before participating in the workshop. A class of four female SCU Public Health Science students spearheaded the project of educating young girls in locales where they miss school when they have their periods, sometimes dropping out entirely. Frugal Innovation Hub students turned the public health challenge into their capstone senior engineering design project. “It was an interesting yet very accidental collaboration with Rose Academies,” said Figueira. In spring of 2017, Stasi attended a conference at SCU, where she learned about the HedhiHelp app project. It fit the mission of Rose Academies: empowering with knowledge the vulnerable girls, women, disabled and deaf in rural villages in eastern and central African countries. So Stasi came on board with SCU to field test HedhiHelp. “It’s a blessing to have met Susan Stasi and have her take our app to the girls in Uganda and make it all work,” said Parker. The app was designed for low-resource settings. The school where Stasi tested it didn’t have Wi-Fi, so the app was taken offline and shown on tablets charged by portable solar power units. 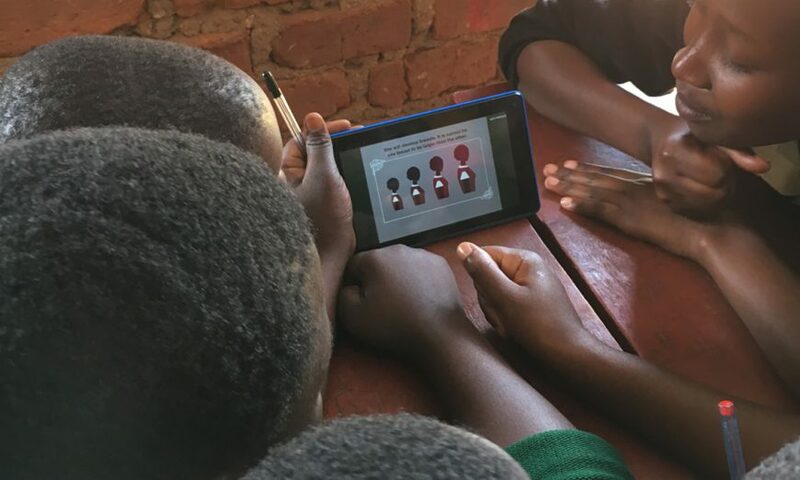 “Whenever we deploy things in Africa, some adapting to the reality in Africa is required,” said Figueira, pointing out that the last mile step of any project is difficult and not always as successful as the HedhiHelp app project. The right to use the HedhiHelp app was donated to Santa Clara-based Rose Academies, which is writing additional health education programs. For use where English is not understood, Rose Academies had HedhiHelp translated into Kiswahili, a dialect of the Democratic Republic of Congo. Translation into Luganda, spoken in Uganda, will soon be completed. Launching HedhiHelp is but one collaborative outreach and partnership in Africa for Rose Academies. 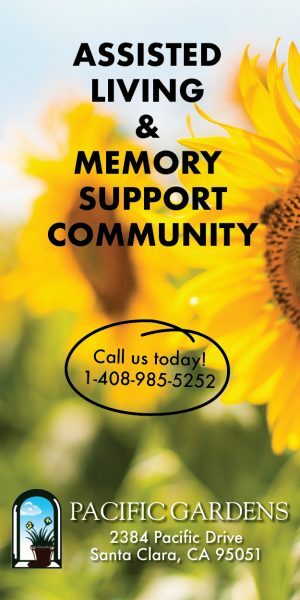 Learn more at its free open house and benefit on Feb. 2, 4 – 7 p.m., at the Santa Clara Woman’s Club’s historic Adobe, 3260 The Alameda, Santa Clara. For information and to register, visit Eventbrite. The Frugal Innovation Hub mission is to engage students and faculty in technological and humanitarian projects through partnerships and programs. For information, visit www.scu.edu/engineering/labs–research/labs/frugal-innovation-hub/.